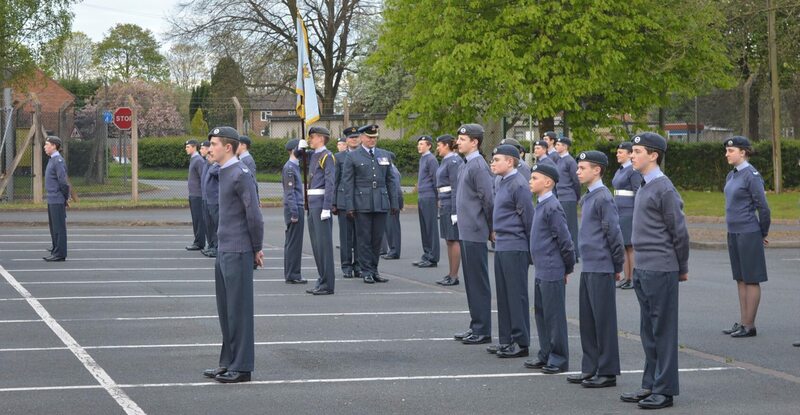 The Morris Trophy is awarded to the Best Largest Squadron in the RAF Air Cadets. Earlier in the year, Wing Commander A. Griffin, Officer Commanding West Mercian Wing nominated us to represent the Wing for the award. The next stage was for Group Captain Simon, Regional Commandant Wales and West to inspect us – as well as five other squadrons in his region – to decide who he wanted to choose to represent the Region. On Thursday 20th April, the Regional Commandant visited the squadron to conduct his inspection. The evening started with a formal outside parade where the Regional Commandant spoke to each cadet as he made his way between the rank of cadets. The parade concluded with a march past. Following the parade, Cadet Sergeant T. Wassermann, Cadet Corporal C. Walthorne and Cadet D. Whalley spoke to the Regional Commandant about the past year’s activities. Below: Wales and West Regional Officer; Flight Lieutenant G. Vince, Officer Commanding 2497 (Cosford) Squadron; and Group Captain R. Simon, Regional Commandant Wales and West. The remainder of the evening consisted of multiple activities being run throughout the squadron, including radio communications training, modelling, flight simulator training and a Duke of Edinburgh’s Award debrief following a recent practise DofE expedition. Below: Sergeant S. Jones teaching cadets about Radio Communications. Below: Cadet Cross and Cadet Sergeant T. Wassermann are seen using one of the squadron’s flight simulation computers by Don Rhodes, Chairman 2497 (Cosford) Squadron Civilian Committee; and a Wales and West Regional Officer. 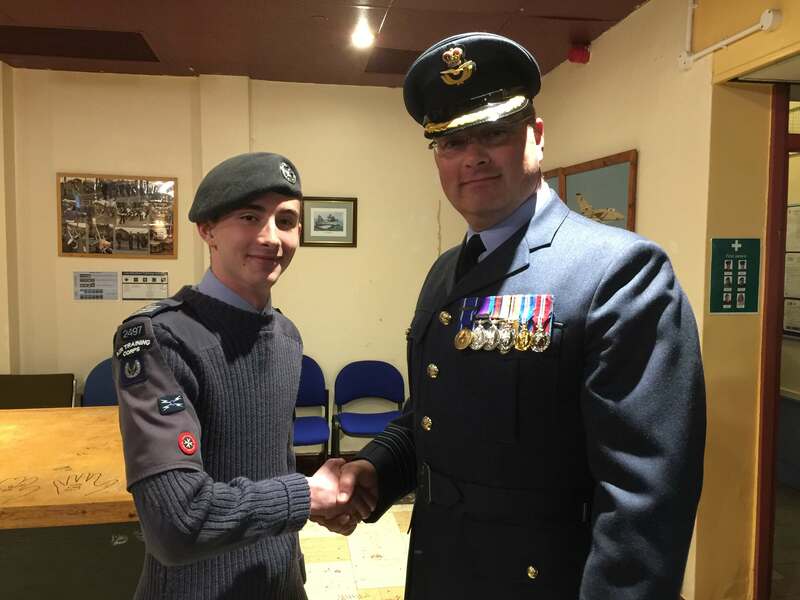 The evening concluded with the Regional Commandant promoting Cadet Sergeant A. Killeen to the rank of Cadet Flight Sergeant. @2497Sqn @ComdtAC Very well done all. Thoroughly enjoyed my visit. It was announced on Wednesday 26th April that the Regional Commandant has selected 1122 (Marmion) Squadron as the Regional nomination for the Morris Trophy. Air Commodore McCafferty, Commandant RAF Air Cadets will now inspect a total of six squadrons (one from each region) to decide on who will be awarded the Morris Trophy for the Best Largest Squadron.